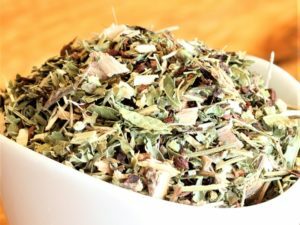 Internal Bliss #2 (Laxative Tea) is a blend designed to keep things moving smoothly, intestinal-y speaking. We won’t beat around the bush here. Not only does this tea help with uncomfortable constipation, but it tastes great. Senna is the primary ingredient that aids with the discomfort of constipation and the agent that kicks your gut system into action. Senna is used as a laxative, licorice adds a little sweet, peppermint ties the blend together, and ginger helps with digestion.